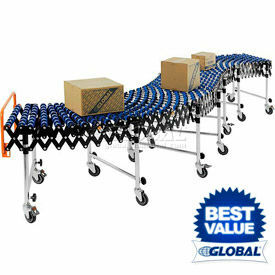 Instantly set-up Conveyor Lines for Shipping, Receiving, Assembly and Packaging areas. Flexible, Portable Gravity Conveyors expand to suit requirements and contract to save space when not in use. 175 lbs. per foot capacity. Zinc plated telescopic legs with 4" thermoplastic rubber swivel casters adjust independently from 31-3/4" to 40-1/2"H to achieve maximum gravity flow and create banked curves. End legs have locking brakes. Includes convenient box-stop and hook couplers to connect additional conveyors. Simply insert legs into integral sockets and conveyor is ready to use. 1 Year Limited Warranty. Skate Wheel Conveyors offer smooth movement of multi-sized material, and feature rugged 5/16" steel axles and self-tracking skate wheels with enclosed steel ball bearings. 1-1/4" (compressed) to 4" (expanded) axle centers for a 7" minimum package size. All units bend around a 27" radius. Roller Conveyor is used for material with flat or complex bottoms. Rugged 5/16" steel axles and 1-3/8" dia. galvanized steel rollers, sealed bearings and spring loaded axles offer smooth material flow. 5-1/4" axle centers for 11" minimum package size. Unit bends around a 12" radius. NestaFlex® Portable Flexible & Expandable Gravity Conveyors provide convenient Material Handling and Transportation for Shipping, Receiving, Assembly and Packaging Stations. NestaFlex® Portable Flexible & Expandable Gravity Conveyors are made of steel for long lasting durability. Retractable conveyors reduce to 25% of expanded length for compact storage. Features telescopic legs that adjust in height for the proper material flow, and includes swivel casters with brakes on end legs for easy transport. Adjustable lengths are between 2'4" to 8'11" and 12'5" to 41'6". Available capacities are 200, 226 and 376 lbs per ft. Roller/Wheel types are Galvanized Steel, Polymer, and Steel. Dimensions and leg sets vary per model. Roller Conveyors are used for material with flat or complex bottoms. Skate Wheel Conveyors offer smooth movement of multi-size material. 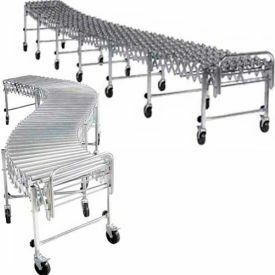 BestFlex™ Portable Flexible & Exandable Flexible Powered Roller Conveyors are made of aluminum and steel for long lasting durability and dependability. 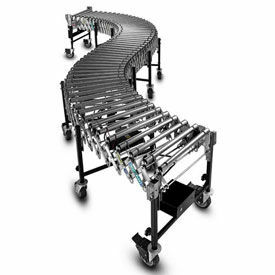 Conveyors provide convenient material handling, maneuverability and transport. Units provide ergonomic working conditions, increase productivity and reduce lead times for efficiency and cost effectiveness. Powered feature allows variable rates of speed for increased output. Conveyor type is Steel Roller. Weight capacity is 100 lbs per ft. Dimensions vary per model. NestaFlex® 22614008N Flexible Conveyor - Poly Skate Wheels - Nylon Bushings 226 Lb. per ft.